Thelazia callipaeda is transmitted by secretophagous arthropod-borne zoophilic nonbiting vector flies of the order Diptera, family Drosophilidae, and genus Phortica (Amiota) variegata. These insect flies act as intermediate host and ingest embryonated eggs or primary-stage larvae while feeding on lacrimal secretions of definitive hosts, which are, generally, wild carnivores, dog, cat, foxes, and humans. Larvae take around 3 weeks to mature into infective third-stage larvae in the body cavity of the flies [Figure 1]. These flies wander around the eyes of animals and humans at the daytime, finally landing on the eyes and releasing the infective larvae on the host conjunctiva. Therefore, the prevention of thelaziasis is difficult to manage using protective bed nets at night. Third and fourth-stage larvae (adult stage) that parasitize the conjunctival sac of definitive hosts lay ensheathed or free motile primary-stage larvae which are infective form for vector flies. 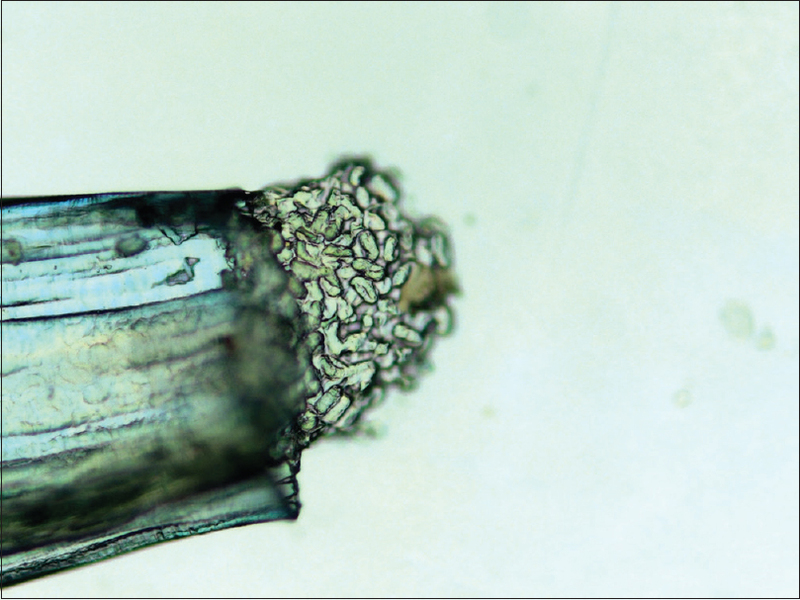 The active reproductive status of this nematode in human indicates that humans are competent hosts for this parasite. Two important species infecting human eye are T. callipaeda (in Europe and Asia) and Thelazia californiensis (in the western United States). Recently, a third species, Thelazia gulosa, is discovered as a cause of human thelaziasis in USA. An 80-year-old male from mountainous region of Assam visited the clinic of our institute with complaints of diminished vision along with foreign body sensation, watering, and occasionally some black shadow moving in front of the right eye (oculus dexter [OD]) for last few weeks. Patient is a cattle rearer by occupation and also does farming, occasionally. On physical examination, unaided visual acuity OD was counting finger at 2 m and oculus sinister (OS) was 6/24p. Under slit lamp, both the eyes (oculus uterque [OU]), lids, lid margins, and eye lashes were normal. 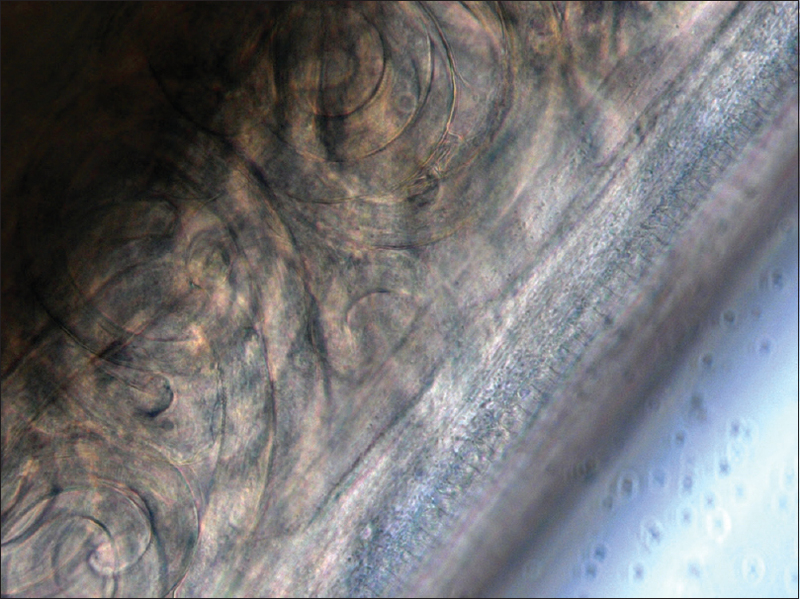 OD inferior palpebral conjunctiva showed follicles and further examination revealed coiled creamy white thread like worms in the inferior conjunctival fornix [Figure 2]. Under direct illumination, worms became coiled and still while in dim light; they uncoiled and showed wiggling. One worm expelled spontaneously during examination. Remaining two worms were retrieved with the help of cotton swab. Other anterior segment findings were insignificant. OS external and anterior segment examinations were within normal limits. On dilated fundus examination, OU was hazy view, red glow was seen, and disk and vessels appeared normal. Other details not made out. The patient's all routine laboratory, including absolute eosinophil count, and stool investigations were within normal limits. Total three worms, creamy white in color with striations throughout, were retrieved and sent immediately in normal saline to the pathology department, where one of the worms was examined directly under compound microscope (Axioskop 40 with AxioCamMRc, Zeiss, Germany). Worm measured around 16.80 mm in length and 0.71 mm in thickness. Morphologically, worm had slender body with prominent scarliform striations and rectangular buccal cavity with prominent tooth [Figure 3]. Further examination revealed multiple embryonated eggs [Figure 4] and primary-stage larvae or baby worms [Figure 5] within the abdominal cavity. Larvae were distinctly seen within the abdominal cavity, and on pressing the abdomen, eggs extruded from the vaginal opening of the worm [Figure 6]. 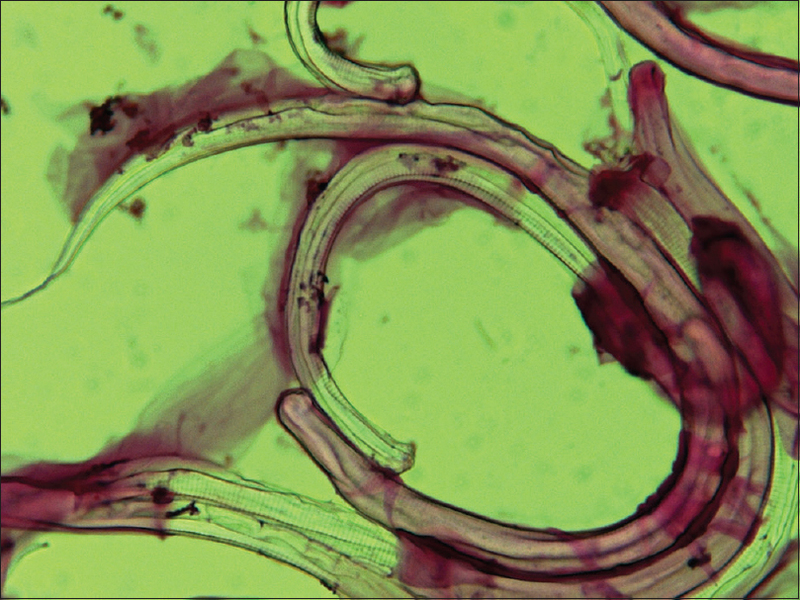 After fixation with formalin and hematoxylin and eosin stain, baby worms were seen with cross-striations [Figure 7]. Aforementioned morphological peculiarities confirmed our diagnosis as gravid female T. callipaeda. There are a few cases of Thelazia infestation among humans reported from India. Friedman reported cases of human thelaziasis from Salem district, India, in 1948. Singh et al. reported two cases in 1993 from Manipur, India. 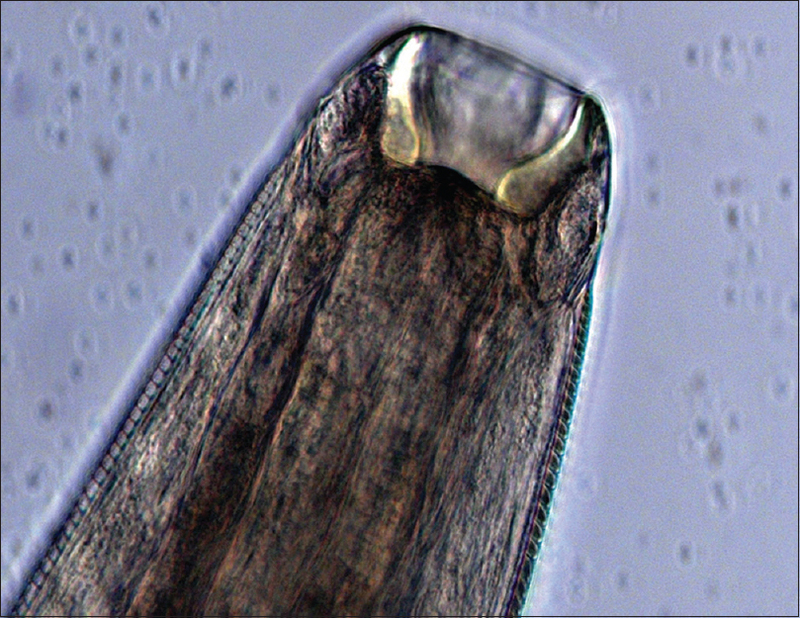 In the report by Mahanta et al., where the case was reported as genus Thelazia, the worm isolated as an immature male and for which species differentiation could not be done. Subsequently, a few cases of thelaziasis were reported by various authors from Manipur, Assam, Himachal Pradesh, Haryana, and Karnataka.,,,,,, Most were found to be caused by T. callipaeda and a recent report was published documenting the first case in India to be caused by T. californiensis. In our case, patient was harboring worms with both embryonated eggs and larvae in the abdomen, which denotes a highly infective state. Five percent povidone iodine was instilled in conjunctival sac for 3 min followed by profuse irrigation with Ringer's lactate and patient was put on oral Albendazole 400 mg at bedtime for 3 days followed by a repeat dose after 2 weeks. After completion of treatment course, patient underwent cataract surgery followed by thorough examination of posterior segment, to rule out any evidence of intraocular thelaziasis. Spread of Thelazia is more prevalent in areas with poor hygiene or sanitation and overcrowding, where humans live in close contact with animals. 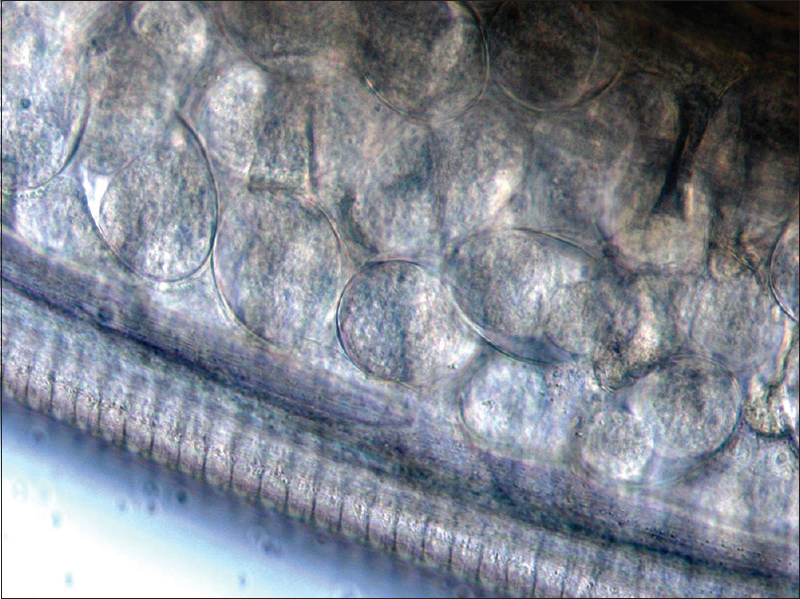 A few reports of human infestation by eye worm throughout the last few years correspond with the detailed scientific and biological information recently acquired on this nematode and its life cycle. With the growing need of time and increasing prevalence of these eye worm in human population, ophthalmologists should be made aware of keeping this zoonotic condition as one of their differential diagnoses, especially when they encounter a patient with clinical findings of relatively quiet eye, foreign body sensation, follicular hypertrophy of the conjunctiva, excessive lacrimation, or some black shadow moving in front of the eyes, which might denote moving worms over the cornea! As per the search results in PubMed and Cochrane search engine, this is the first report of human case of gravid Thelazia infestation with simultaneous existence of embryonated eggs and primary-stage larvae in the same worm. Otranto D, Dantas-Torres F. Transmission of the eyeworm Thelazia callipaeda between fantasy and reality. Parasit Vectors 2015;8:273. Otranto D, Lia RP, Buono V, Traversa D, Giangaspero A. Biology of Thelazia callipaeda (Spirurida, Thelaziidae) eyeworms in naturally infected definitive hosts. Parasitology 2004;129:627-33. Bradbury RS, Breen KV, Bonura EM, Hoyt JW, Bishop HS. 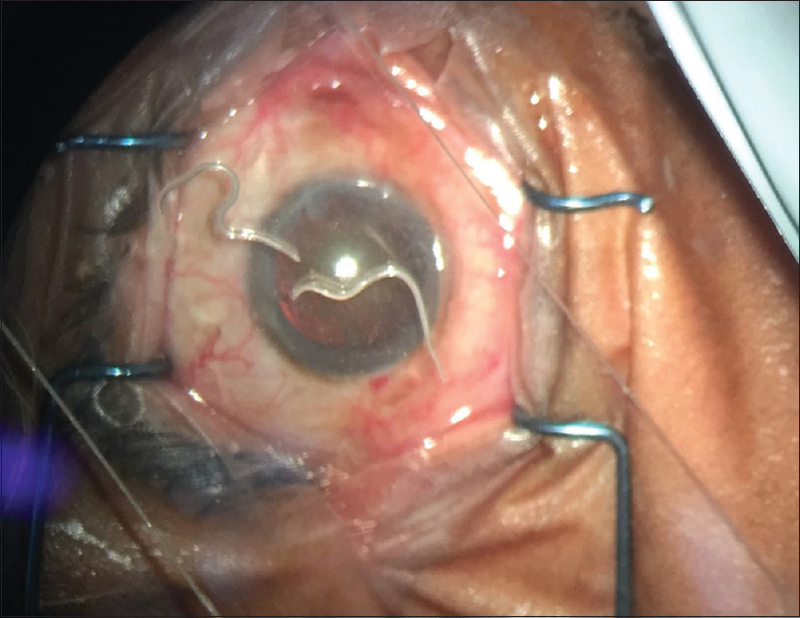 Case report: Conjunctival infestation with Thelazia gulosa: A novel agent of human Thelaziasis in the United States. Am J Trop Med Hyg 2018;98:1171-4. Friedman M. Thelazia callipaeda, the Oriental eye worm. Antiseptic 1948;45:620-6. Singh TS, Singh KN. Thelaziasis: Report of two cases. Br J Ophthalmol 1993;77:528-9. Mahanta J, Alger J, Bordoloi P. Eye infestation with Thelazia species. Indian J Ophthalmol 1996;44:99-101. Sharma A, Pandey M, Sharma V, Kanga A, Gupta ML. A case of human thelaziasis from Himachal Pradesh. Indian J Med Microbiol 2006;24:67-9. Nath R, Narain K, Saikia L, Pujari BS, Thakuria B, Mahanta J. Ocular thelaziasis in Assam: A report of two cases. Indian J Pathol Microbiol 2008;51:146-8. Singh K, Khindria A. First case of human ocular Thelaziasis from India caused by Thelazia californiensis: A case report. IOSR-JDMS 2018;17:24-7. Krishnachary PS, Shankarappa VG, Rajarathnam R, Shanthappa M. Human ocular thelaziasis in Karnataka. Indian J Ophthalmol 2014;62:822-4.